It happens to me with my rom. I try always in DeSmuME, and doesn´t work. So then I try with melonds and works perfectly! I have tried nogba and it's worse. Dont worry, Im hoping to fix my Vista this weekend. 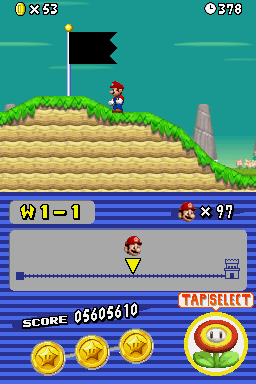 Now, I have managed to make World 7-Castle and I tested it the 10. Hence, the 10 is this close to being unplayable because of ram. And yes, I have tried Melon DS but ran into a couple issues because it's still in development. Desmume works depending on what bit PC you have. I know that. Anyways, went ahead and custom made this attachment. the PC image could use work but I think I did good with the phone and the DS. Except "How do I play that on phone [or tablet or a pc]" spam now. Also, laptop picture lacks a trackpad and has ultrawide screen. Do you need testing? I can test on my DS? When I finish all the levels graphics and code, I will let you be a Beta tester. This hack looks pretty good. umm guys can you guys tell me how to load this game on android? Have you patched a NSMB ROM or just trying to put a patch file (*.xdelta) through Drastic? I made this from a spare tile on the Jyotyu combined with flagpole parts from the Subnohara. It looks cool but it looks like it's too big. What do you guys think? It'll be the closest to a physical checkpoint unless Newer DS Code is released. Save or Scrap? I mean this'll get scrapped anyway when the Newer DS code is released, but you could maybe try adding new tiles to the jyotyu. It's pretty easy, so long as you don't follow meromero's tutorial (it overcomplicates things for nothing). you can simply do so by exporting the graphics, adding the graphics you want and reimporting with existing palette. this will cause some minor graphical errors, which are easily fixable in NSMBe's graphics editor. I tried adding the flag to the subnohara first, but I had to extend the image to add it. Sadly, even if it did work, the palettes went beserk and I had to replace the whole tileset just to get the palettes working again. Thanks for the advice! You mean when you tried extending sub nohara? Did you forget to use the ASM hack? that was before you mentioned it. So yeah... It's a weird situation for me and ASM hacks. I cannot apply them until I go to my grandpa's house. Y'see, his computer is the only one with Devkitpro installed. I couldn't get it on my 10 or Vista probably because it's either not enough room or the OS is no longer supported. Not asking for help here, but that's what I do. Sounds good, I'll look forward to that. Update! Well, sorta. I have not touched this hack in 2 weeks. My time is taken up by school, going places, and other things. Plus when I do have time I just go "UUUUUGGGHHHH Hacking is so difficult on the itty bitty PC" Lazy I know. I did make some decisions though. I stated a while back that I'd use the original Code of the blue shell as a gimmick. After thinking about it, it wouldn't be a good idea so I'm going to update the physics of it to be less annoying and scrap the idea. Game's still coming. 2019 baby. Its time for an update! Level 2-A is almost done. I havnt done much else. I just got news that in a month or two, I am going to take a huge role in rebuilding a 2001 Chevrolet Tahoe. Engine, trans, body, everything. So, I'm not rushing per say, but I am going to work hard to get the hack done by then with all the other crap I have piled up on my to do list. It's still coming. Trust me.